One size Spa, does not fit All. When making a large purchase like a spa, the best way to avoid regret is to choose the product that best meets your needs. There aren’t many products that have a large health impact on life and that are so much fun. Take the time to choose a spa that fits your comfort needs. Our spas are made with great care when designing the seats and lounge spaces for ultimate comfort and integration with the massage jets. With our spas entertainment systems, you can relax as you renew your mind. Here we will cover what to keep in mind such as health, therapy and entertainment when selecting the spa that works for you. We will also cover how American Spas keeps your diverse needs in mind. When thinking about buying a spa, it’s important to consider the models that speak to both your budget and needs. Here are three different spas that cover three different lifestyles and needs without paying for dealer mark up or shipping. When you lifestyle includes physical activity a spa can help you maintain your health by promoting relaxation after a workout session. Creating an area dedicated to relaxation and meditation will give you a place to unwind after a high impact routine. When you sink into your hot tub, the effect of buoyancy decreases stress on your muscles and joints, allowing for a period of recovery. If you are looking to personalize you’re routine and sustain healing while you gain muscle or simply tone up. Our AM418B is an optimal option. American Spas AM-418B 2-Person Hot Tub 18 Jets Plug-In-Play system, Handrail waterfall Spa LED light Multi Color – This spa comes with everything you need to relax. Sit and soak in the comforts of your own home or on your outdoor patio. 18 Powerful stainless steel massage jets will make you feel totally relaxed, refreshed, and rejuvenated. While specifically located hand jets soothe away your palm and wrist tension. More and more, people are discovering that soaking with their partner in a spa can provide the relief and comfort they need to rejuvenate and reconnect everyday. Many weave spa hydrotherapy into their daily lives. Hydrotherapy is an alternative therapy recognized for temporary pain relief of ailments such as osteoarthritis, rheumatoid arthritis, muscle & joint pain, fibromyalgia, and aches. If your goal is to enjoy greater flexibility and additional energy throughout the day our AM628TS is a perfect match. American Spas AM-628TS 2-Person 28-Jet Triangle Spa, Plug-In-Play system, with Multi Color Spa Light, Cover – Combining classic design, cutting-edge technology and affordability this Spa delivers a total body hydrotherapy experience unlike any other. This intimate triangle spa is ideal for couples and empty nesters seeking a relaxing way to spend quality time together. This two person triangular spa features 28 Red Star Fire jets crafted to maximize the performance of the spa and carefully placed along the lines of the body to deliver the highest quality hydrotherapy and relaxation experience. Everyone loves a great party especially when it involves a hot tub! Spas are perfect for having fun and socializing with friends and family any time of year. A spa sets the mood for a good time almost immediately. 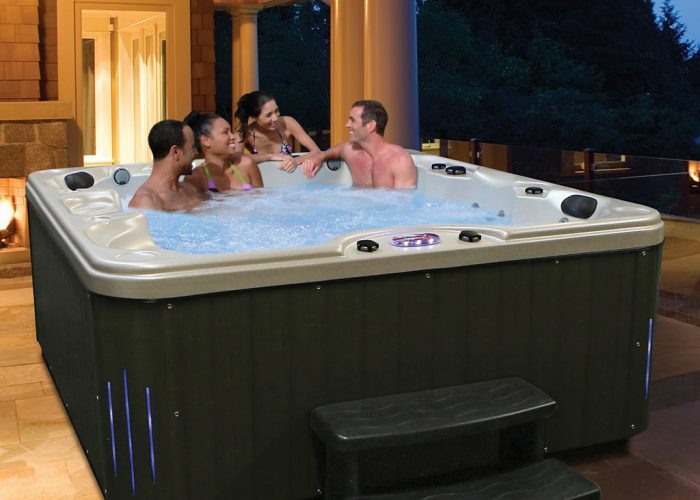 Select a hot tub that will hold as many of your group as possible. Remember, the more the merrier is the rule of thumb with selecting a hot tub. For all fun occasions the AM885LG is the best luxury spa there is for the price point. American Spas AM-885LG Harmony 6-Person Spa LED Handrail waterfall, LED underwater lighting, with Stereo & Subwoofer, Ozone Sanitization – Exquisite Interior Perimeter Lighting and Multi-Color LED Spa Lights make relaxing in your Harmony hot tub a visually entertaining experience whether you are enjoying your spa alone or with your loved ones! The Harmony’s HydroClear Ozonator and exclusive Bio-Clean Filter ensure that spa maintenance is easy and simple so that you save money and have more time to enjoy your spa! The bluetooth Freedom Sound System with Subwoofer completely transforms your spa into an entertainment center so that you and your friends and family can enjoy quality sounding music every time you decide to use your spa!